Happy New Year! I don't know about you, but I'm kinda glad all the hoopla of the holidays is over. Don't get me wrong - I love seeing all the holiday lights, and getting and giving presents, and seeing my family and friends. But, it's also a stressful time. Traveling takes a toll on me, all the rich holiday foods mean I'll have a breakout or two, and I don't sleep as well or as much, so my eyes are carrying around as much baggage as I am. Well, they would have been, if I hadn't been using my new Valentia True Glow Eye Cream! Even traveling just a little bit north this winter caused a major dryness in my normally oily skin. Several of my nails dried out and broke, and it seemed like I couldn't get enough hand lotion. I took my Valentia True Glow Eye Cream with me to use as an eye cream, but I ended up using it as an all-over face serum because I liked it so much! A while back, I was lucky enough to review Valentia's Even Glow Serum, and the eye cream has the same delicious orange juice scent. It's a little thicker, so the pump dispenser makes a great choice for this product. The amber bottle helps to block out light that can diminish the effectiveness of the cream. This eye cream has some great, effective ingredients for the delicate eye area - and the whole face, too. Astaxanthin and Rosehip oil increase moisture levels, which smooth out fine lines and wrinkles. Resistem is a plant stem cell that helps protect against pollutants and stress-related aging (and what better time to test that than the holidays?!) Arnica is a natural pain reliever, and helps with inflammation. Boozy egg nog is probably a better pain reliever, but it does nothing for those puffy eyes! One or two pumps was enough to cover my entire face and neck with the delicious orange scent. It's texture is not too thick that it rubs or pills, but rich enough to feel like a cream. It didn't cause any breakouts for my oily skin, and it absorbed quickly enough to be used in the morning under my makeup, as well as the evening before bed. It even helped me feel more radiant on my no-makeup days - it does seem to impart a nice glow, though there's no glitter or shimmer in it. Valentia-inspired nailart! I did a plastic-wrap dabbing technique for the base by painting it with Wet 'n Wild Warm Filter first, then dabbing on OPI Espresso Your Style. I painted on a white stripe in the center and did a version of the logo with Sephora X Torque over it. 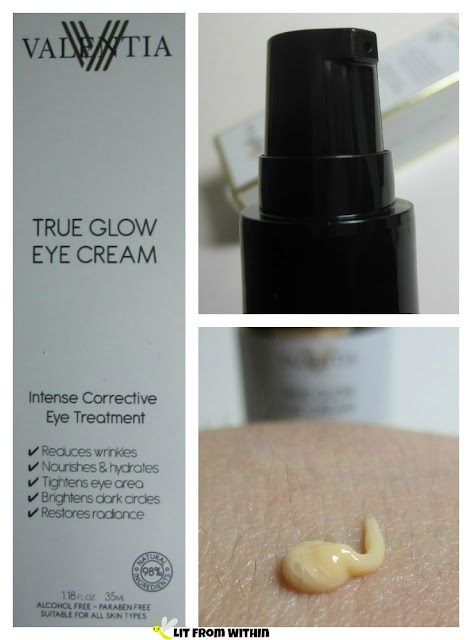 Even though I'm done traveling, I'm still using the Valentia True Glow Eye Cream not only on my eyes, but as a face serum. I just love it, and the smell is refreshing. At $24.99, I don't have to feel guilty about using a little more, either. 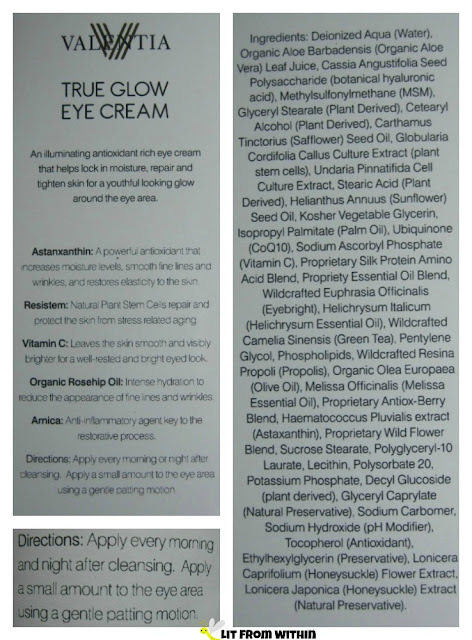 If you'd like more information on Valentia's True Glow Eye Cream, they can be found on their website, and Amazon. Have you ever loved an eye cream so much you just used it all over?